There have been many notable writers who heaped praises on the Book of Job. Victor Hugo was said to have claimed that if all literature would be destroyed and he could only retain one book, it would be the book of Job. It is a quote that cannot be verified though. Still, that such a quote could survive through the generations and still exist today must mean that the Book of Job contains some true literary quality in it. If you look at the outline of the book in brief, there are 3 cycles of debates between Job and each of his three friends – though the final cycle is often considered incomplete – and many of the same ideas are repeated throughout each cycle, just with increasing emotions and extents. Job calls these debates long winded speeches [Job 16:3], and while we may get tired of his unceasing and emotive defence of himself; his evaluation of himself in the middle of his crisis and in the middle of all the debates stands very true – self-righteous he may be, complaining and crying he might have; but his hands have been free of violence – or evil deeds – and his prayer and petition to God has been pure – unchangingly so. yet – From verses 6-16 Job goes on and on, as usual, about the extent of his sufferings and how God and men had all abandoned him, and how miserable his current circumstance was. He may be hard to read, but let us consider the extent of grief and pain that he was made to go through. Perhaps a lesser man would have been more extreme in his grumbles against God and men. In poetic fashion, with the application of a single ‘yet’, the entire tone of the Job’s speech changed from pessimistic, depressed hopelessness to one of faith and hope. In spite of all that he has gone through, somehow, his hands have been free of violence and his prayer remained pure. Was he showing off at how righteous and devoted to God he was? I think there was an element of self-righteousness in there, as with in most of his speeches, but I think there’s also an element of awe in there – despite all that he has been through, somehow he has remained righteous. Surely that wasn’t humanly possible; surely there had been divine grace and interference from God. Job hasn’t lost hope in God. He still believed that God’s deliverance would come. And because he still believed so, he was able to remain righteous. 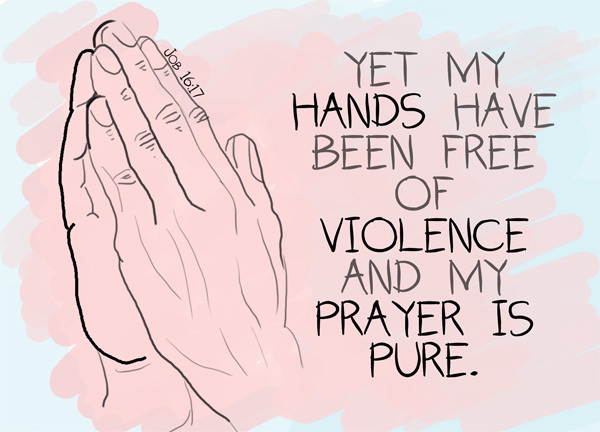 my hands have been free of violence – This was likely in response to the charges that his friends have continuously brought against him. I’ve been subjected to your unkind treatment, but it is not because I’m guilty of the sins that you’ve charged me with. Even with his afflictions, he had stayed free away from iniquity. He had not caused anybody injustice. He had not hurt anybody. my prayer is pure – this was also a response to Eliphaz, who believed that Job was guilty of great sins and thus deserved his great personal disasters and viewed his defence of himself as lies and his petition to God hypocritical [Job 15:4]. Yet, despite facing all his afflictions, including the insensitive and unfair accusations held by his friends, Job was able to say, my prayer is pure. His mind was clear enough to know that his prayer had stayed pure. His mind was clear enough to that he ought to keep his prayer pure. His mind was clear enough to know that despite all that he had suffered, his only possible deliverance was from the Lord, and come it shall eventually. Are your prayers pure? Do you pray sincerely, or do you pray hypocritically, because you are obliged to, because it is a routine, because there are people watching? Do you pray quickly, so that you can hurry to lunch? Do you pray curses and wish for disaster on others? Do you pray with piety and devotion to God? Do you believe that God listens to prayers? Are you still able to pray in hard times? Are you still able to intercede for others when your own life is in a mess? As Stephen the martyr was being stoned to death, he fell to his knees and prayed, Lord, do not hold this sin against them [Acts 7:60|Article]. Well, that’s probably rather extreme. That’s more on forgiveness and grace than anything, but isn’t that a perfect example of having pure prayers? Let us learn from Job how to keep our prayers pure even in impossible situations.